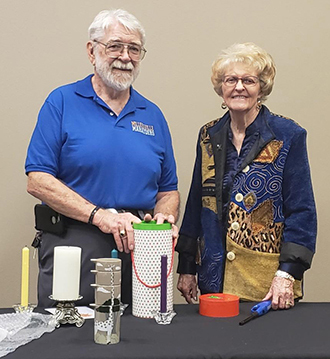 The Artesia Association of Educational Retirees (AAER) elected new officers for 2019 during its monthly meeting Jan. 11 at Hotel Artesia. Pictured above from left are Charlotte Schiel, treasurer; Nancy Harding, secretary; Camille George Florez, president; and Kathy Phipps, vice president. The AAER also acknowledged outgoing president Joe Schiel, pictured below with Florez, for his nine years of service. The AAER is an active group of retired Artesia Public Schools employees who meet at 11:30 a.m. on the second Friday of each month to focus on maintaining contact with the local and state education profession and an active role at the legislative level in regard to assuring retirement security for those who have served New Mexico’s students.